Message on the card inside reads: "Looking at you I see wonder, joy, strength"
According to sculptor Susan Lordi, this piece was directed by the models. 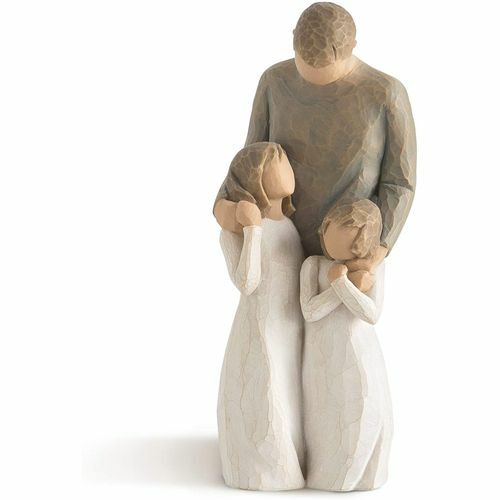 The poses that the girls naturally assumed showed their relationship with their dad in an uninstructed, natural manner. Their father was the anchorthe girls fluttered around him. Susan got a sense of how the girls saw him as strong and reassuring. They looked at him with a my dad can do anything look, something common to all father/daughter relationships. The dad was clearly having fun being with his daughters. 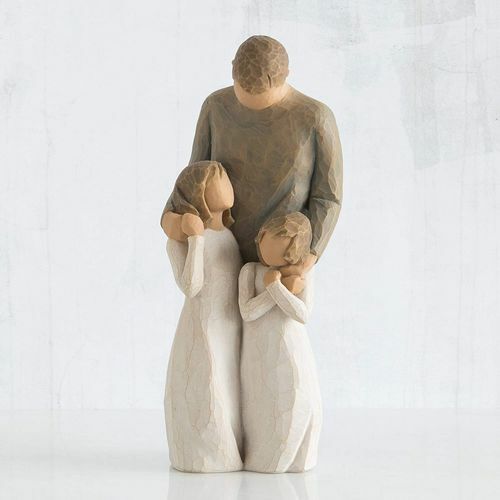 Susan wanted to make this Willow Tree ornament a two-way piecethe girls look to his strength and stability, and he looks to them as his greatest source of joy. The beauty of a good father/daughter relationship is in its duality and the sentiment can be read from either perspective father to daughters, or daughter to father.